This guide aims to help you set up automated daily site backups. Site backups are full backups of your site files (media, themes, and plugins) and database. 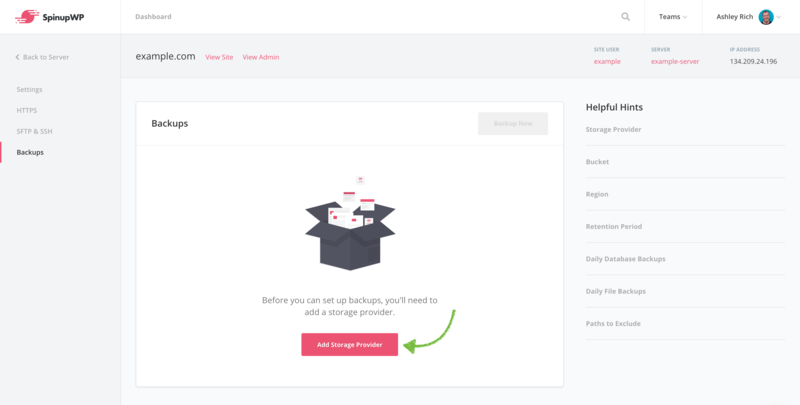 Before you can enable site backups, you must add a storage provider, which are cloud storage providers where your backup files will be stored. Navigate to the Backups tab under a site and click Add Storage Provider. Once you’ve created your provider, enter the bucket name and region where you would like backups to be stored. The bucket must already exist on your chosen storage provider before entering it on SpinupWP. Select a retention period (in days), which is the length of time to keep backups on your chosen storage provider. When a backup is older than the retention period, it will be removed. Site backups are carried out at 1AM UTC every day. Backups are carried out in a rolling fashion. Meaning, that servers with multiple sites that have backups enabled will only carry out one site backup at a time. This is to prevent overloading your server’s system resources. Therefore, even though site backups are queued at 1AM UTC, not all backups will be started instantly. With daily file backups turned on, all files and folders within the site’s root folder will be balled up into an archive file (tar) and compressed (gzip). Similarly, if you’re using Composer to manage PHP dependencies, it’s likely that you don’t want to include the root vendor directory in your backups. Paths which you manually exclude will be appended to this list. There may be times when you wish to trigger a backup instantly. This is useful if you’re making changes to your site and wish to take a snapshot before deploying any changes. You can perform an on-demand backup at anytime. Navigate to the backups tab on the site screen and click Backup Now. SpinupWP doesn’t provide full server backups or snapshots (as they’re also known). We believe that these types of backups are best performed by your server provider (DigitalOcean, etc). Full server backups can be enabled when provisioning a new server in SpinupWP (for supported providers). Alternatively, they can be enabled via your server provider’s control panel at anytime. Storage providers are attached to your personal account or a team account. Here you can add, edit or delete storage providers.